.Yes, we shall play through the winter, thanks to Hanley's resident engineer, Ian, here demonstrating his latest contraption, the Sponge Milker. Shortly after this demonstration a leak was discovered in the bottom of the wheelbarrow. Dragons' Den here we come. Hanley Tennis Club is an especially lovely place to play tennis and we welcome new members at all levels. We can offer members and their families; coaching, teams and tournaments as well as some of the liveliest social events around. What's more, our membership fees are about a third less than other clubs in the neighbourhood. We are located in a quiet corner of the Shepherds Cot Trust, otherwise known as the Crouch End Playing Fields. This is a peaceful,undeveloped area of 100 acres surrounded by woodland and is the home of a number of tennis and cricket clubs. Alexandra Palace also provides a spectacular backdrop.See How to find us. Our shale courts are a bit special. 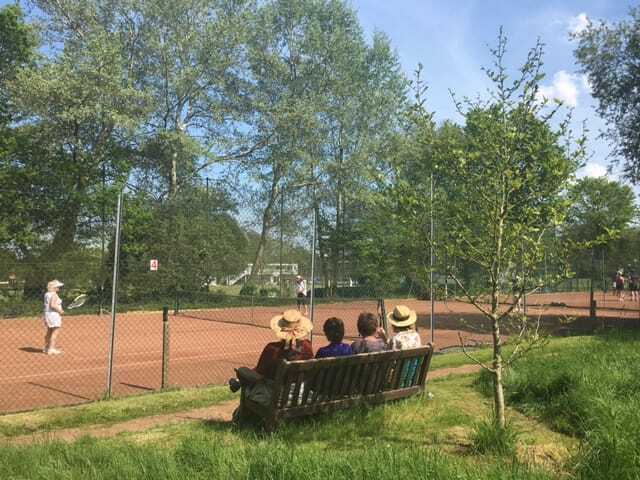 A similar surface to that played on at the French Open, shale courts are now increasingly hard to find and consequently highly prized. Shale is a great surface for beginners and children, as the ball bounces less fast than on tarmac, and older players find it is kinder to their joints. With our floodlights, specially designed frost covers and court sprinkler system, we aim for all-year-round tennis. For more information see Tennis at Hanley. Hanley provides a friendly atmosphere for social tennis, and membership is based on mutual respect for other members. The club is a co-operative venture and we do as much as we can ourselves to look after the courts and clubhouse. ​Yes, it's true, Hanley's very own everyman, Sid Caudri, is the star of the LTA's latest 'Go Hit It' advert. Nice one, Sid. The Men's (home and away) and Women's (home) team fixtures have now been posted on the Hanley Calendar. .Wimbledon Draw and Afternoon Tea on Sunday 28 April. Enjoy the excitement of the Wimbledon draw whilst savouring your afternoon tea. Open Day on 18th May, from 2pm. We welcome perspective new members to this Open Day, sponsored by Nature Valley. We will be organising playing and coaching for visitors, and encouraging newcomers to sign up with a special joining fee waiver. Watch a French film, bring some food to share - preferably French - washed down with some French wine. ​​So the new holders are Paul Eagles and Anne Tapsfield. And what a great day we all had. Huge thanks to Dave for organising it, Yogi for preparing courts, Matt for managing BBQ and the ever active social committee of Nicole, June and Manola. Fifteen pairs turned up including 5 pairs from Maz's coaching group whose youth and enthusiasm put Hanley's age and experience to a severe test. The final was a hard fought one with Sid and Manola up against Paul & Anne (Final), watched by a cheering crowd. A big thank you to everyone who helped make this year's Cot Open Day such a success. "As England were storming to victory against Panama, the sun shone down on the first ever Shepherds Cot Open Day. "The amazing weather could not have been more suited to an afternoon of sporting and environmental fun and discovery. 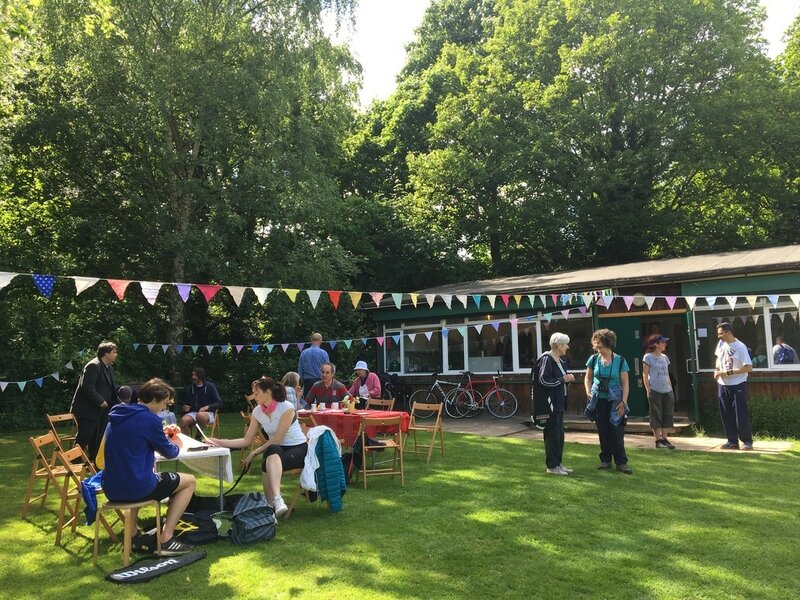 "Supported by neighbours Highgate Wood School & Haringey as one of The Great Get Together events, there were activities galore and a raffle in aid of looking after this voluntary run sporting oasis. "At Hanley those who picked up racquets for free coaching sessions were rewarded with cream teas, whilst on Highgate courts there were games for kids, gruelling workout sessions and an introduction to inclusive tennis with both blind and wheelchair games taking place. "There was also hard fought tennis and cricket matches. Young lads from North London cricket and Highgate cricket won the Cot Cricket Cup which was a'pairs game' while Hanley beat Highgate to take the Cot Tennis Cup in two short straight sets!"